This Paleo-friendly recipe for Leafy Tacos is easy to double. Use leftovers tossed in a taco salad, spooned into a baked sweet potato, or scrambled into eggs. Heat coconut oil in skillet over medium heat until hot, about 2 minutes; add onion and cook until softened, about 4 minutes. Add the garlic, chili powder, cumin, coriander, oregano, cayenne, and salt. Stir until fragrant, about 30 seconds. Add the ground beef to the pan and cook, breaking up the meat with a wooden spoon until no longer pink, about 5 minutes. Add tomato paste, chicken broth, and vinegar. Stir to combine and bring to a simmer. Reduce heat to medium-low and cook uncovered for 10 minutes, until the liquid has reduced and thickened. Taste and adjust seasonings with salt and pepper. 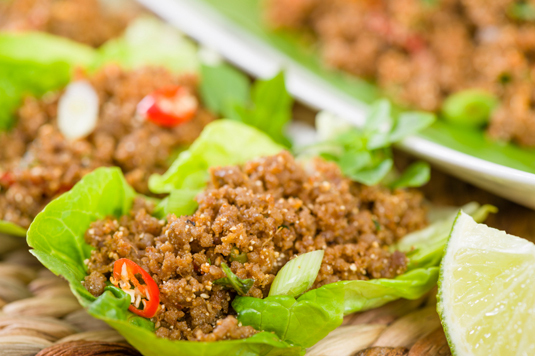 Spoon taco meat into individual lettuce leaves and top with garnishes. Commercial taco seasonings often contain hidden sugars, grains, and soy. Why eat processed seasonings when making your own is so easy — and flavorful? You can also top your tacos with your favorite tomato salsa; just be sure to check the label for non-Paleo ingredients. Per serving: Calories 304 (From Fat 159); Fat 18g (Saturated 8g); Cholesterol 80mg; Sodium 548mg; Carbohydrate 10g; Dietary Fiber 5g; Protein 27g.